We didn’t find any good tables but we did end up finding something even better! 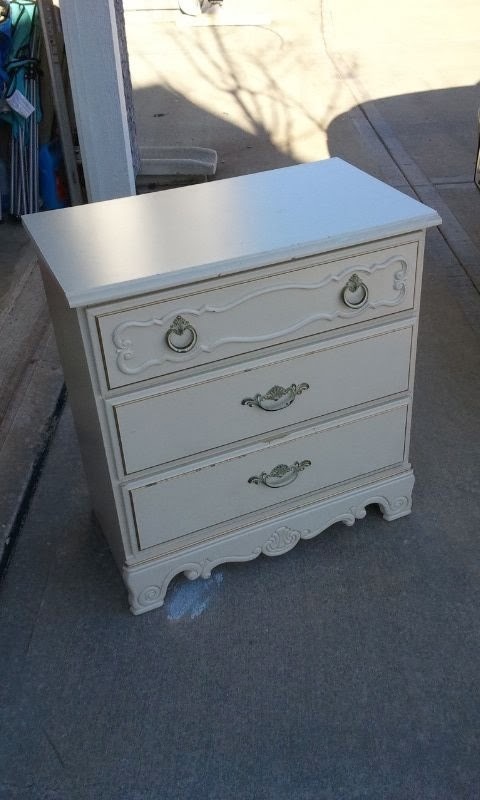 My wife showed me the 3 drawer dresser below and although I wasnt fully convinced at first, I quickly warmed up to the idea of the challenge. So we purchased the dresser and headed home. The first thing I did was to measure out how much of the dresser I wanted to keep. 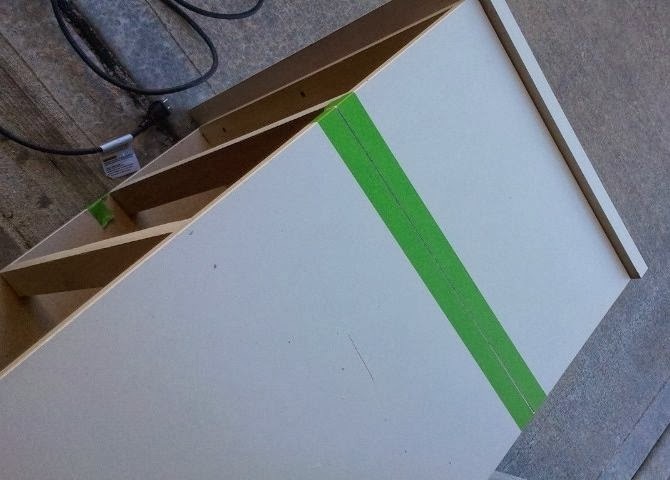 I knew that I was going to need to put a 1/2″ piece of MDF under the desk in order for the rail balusters to connect to so I measured a 1/2″ inch more than the trim piece below the top drawer. I then put some paint tape over my lines to prevent chips when I cut it with my circular saw. Here you can see the two pieces after I made the cut. I might end up using the bottom part for another project. 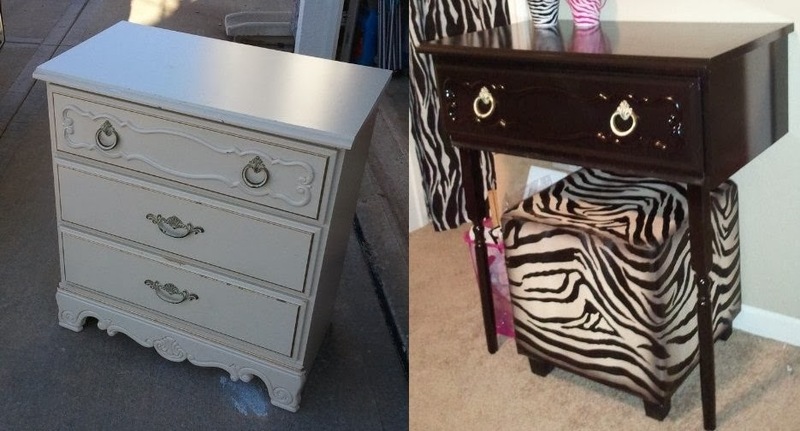 Maybe a nightstand? 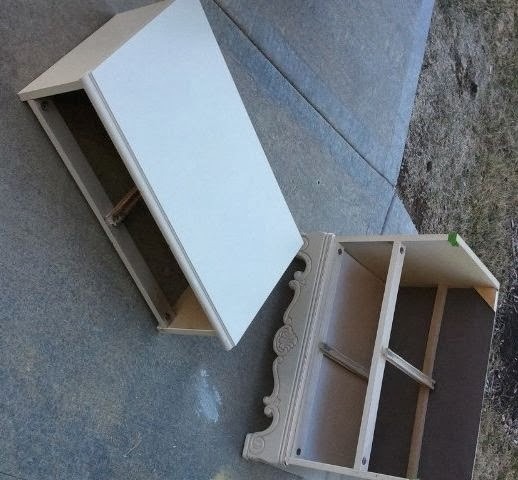 After the dresser was cut and the two pieces separated, I set out to paint. 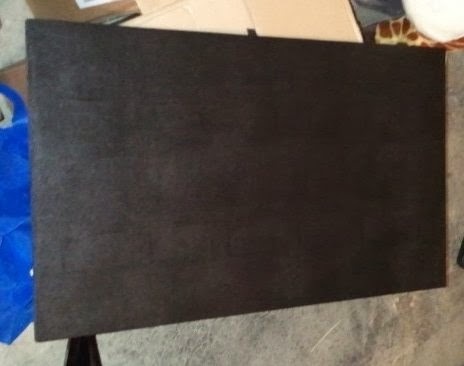 I used a latex high gloss black paint that I applied using a foam roller. It took 3 coats before I finally achieved the look and cover I was going for. The molding on the front of the drawer was plastic attached with screws so I quickly removed it and along with the rail balusters sprayed them both with a high gloss black spray paint. Here is a picture of the 1/2″ MDF being painted to go below the desk. I drilled two 3/4″ holes in each corner to support the rail balusters. This board will be screwed into the bottom of the desk to help hide the drawer and to add some stability. I attached the desk to the wall using 2.5″ screws making sure to drive them into the wall studs. The rail balusters were cut to length to match the desk height and attached to the black MDF using the pre-drilled holes and then inserting the balusters into them and securing them with Gorilla glue and a wood screw. Here are a few pictures of the finished product. I couldn’t be happier with the way it turned out and the girls absolutely love it.